The “Adopt a Bacterium” project is based on the use of social network as a tool in Microbiology undergraduate education, improving student learning and encouraging students to participate in collaborative learning. The approach involves active participation of both students and teachers, emphasizing knowledge exchange, based on widely used social media. Students were organized in groups and asked to adopt a specific bacterial genus and, subsequently, submit posts about “adopted genus”. The formative assessment is based on posting information on Facebook®, and the summative assessment involves presentation of seminars about the adopted theme. To evaluate the project, students filled out three anonymous and voluntary surveys. Most of the students enjoyed the activities and positively evaluated the experience. A large amount of students declared a change in their attitude towards the way they processed information, especially regarding the use of scientific sources. Finally, we evaluated knowledge retention six months after the end of the course and students were able to recall relevant Microbiology concepts. Our results suggest that the “Adopt a Bacterium” project represents a useful strategy in Microbiology learning and may be applied to other academic fields. Collaborative learning can be a useful tool in Microbiology education, encouraging students to challenge and modify what they make of the subject, assess that information and apply it to their own understanding.5 By working collaboratively, students will gain critical and self-critical skills, which are essential to any undergraduate of any discipline. Since students spend a significant part of their daily time in the world of social networks and interactive ICTs, we developed “Adopt a Bacterium”, using Facebook® as a platform to improve teacher–student interactions. Our learning approach is based on active and collaborative processes, aiming at showing students how to learn by themselves, and encouraging them to consider the relevance of science and how it fits into their social contexts. The “Adopt a Bacterium” project was introduced in a regular discipline (Bacteriology) for undergraduate students of the Biomedical Sciences course, at the University of São Paulo – Brazil, during the first year of the course. The “Adopt a Bacterium” project was also developed in order to help teachers cover different topics that, otherwise, would not be covered during regular classes. We hypothesized that the approach would benefit students by promoting an active learning experience, making microbiology more meaningful to them. We also suggested that this approach would help them retain basic concepts for longer periods of time. The study was conducted at the Institute of Biomedical Sciences in the University of São Paulo. Students involved in this study were enrolled in Bacteriology class, offered in the second semester, with a six-hour week load, during 3 months. For the present study, we considered a total number of 68 students, who participated in the course during the academic years of 2014 and 2015. We chose Facebook because of its easy and free access as well as widespread use. These factors encourage students’ participation, productive discussions and active construction of the desired knowledge. Facebook also promotes a better relation among students and between students and teachers, and this is essential to develop an effective learning environment.9 A representative scheme of how “Adopt a Bacterium” works is shown in Fig. 1. Organization scheme of the “Adopt project” method. Students talk directly to mediators (postdocs fellows, graduate and undergraduate students) for scientific support regarding their adopted bacterium. 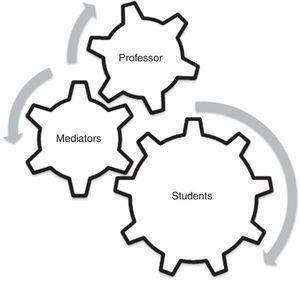 Both professors and mediators maintain constant communication, implementing a collaborative learning environment. The project is based on three important and interactional roles, including: teacher, mediators and students. The teacher acts as the main supervisor and conductor of the project, monitoring all student information posted on Facebook; mediators can be either undergraduate students who finished the Bacteriology course in previous years and had an outstanding performance, or graduate students and post-docs working at the Microbiology Department of the Biomedical Sciences Institute. We try to combine at least one graduate student or postdoc fellow with one undergraduate student for each bacterial genus adopted by the students. Their role is to conduct discussions and guide students during the posting period; and also help students prepare their final presentation. The students, on the other hand, are supposed to post and discuss information about their “adopted” bacterial genus, with special care as to information sources. All posts and discussions must be validated by a mediator. First, mediators were selected and trained on the topics to be covered, and also for the role they would have to perform. Mediators were instructed to make sure students cover general characteristics of the adopted bacteria, such as metabolism, clinical diagnosis, treatment, history and social impact. The “Adopt” project starts in the final quarter of the course, and lasts for one month. It runs parallel with traditional classes. It is important to emphasize that the bacterial groups adopted by the students are not covered during regular classes. In the first day, we present the project to the students, explaining guidelines and rules as to copyright, cyberbullying and proper behaviour in social media. After that, they are divided into groups and each group adopts a specific bacterial genus or group of species. The training starts with students making different posts regarding the adopted bacterial genus, followed by discussions with all classmates about the chosen subjects, using the Facebook platform. Students talk directly to mediators in order to have scientific support regarding their chosen subject, creating an active and collaborative learning environment on Facebook. Mediators post different questions and offer advice to students about the material that they need to post, or about specific aspects they should look for. Both professors and mediators maintain constant communication. To assist in the learning process, laboratory practical classes are conducted with each chosen bacteria. Different microbiological techniques and procedures are addressed, including: bacterial cultivation, staining methods, antibiotic susceptibility tests and disinfection procedures. The tests and procedures are performed with all the adopted bacteria (Fig. 2). At the end of the posting period, students present seminars about the adopted subjects. We encourage students to be creative in their presentations, which should last no longer than 40min, and we leave them free to cover the topic in a playful and enjoyable way. Facebook, together with laboratory classes, as an active and collaborative environment of knowledge construction. The implementation of the “Adopt Project”, using the Facebook platform enables a deeper understanding of theoretical and practical concepts covered in class lectures. Students participated in three anonymous and voluntary surveys with open and closed questions, to evaluate the benefits that the project provided, and their total impression of the project itself. The use of surveys is common in educational researches; closed questions allow quantitative analysis of answers, and open questions allow qualitative analysis. However, the assessment of open questions needs tools and knowledge of text analysis. In our surveys we use open questions in first and last survey and closed questions in the second survey, according to our goals. The first one was administered on the first day of the project, right after the “adoption” of their bacteria. Students answered the question, “What do you know about the adopted bacterial group?” The second survey was applied at the last day of the project, one week after the seminar presentations (Figs. 3 and 4A). “Adopt project” students’ evaluation. Students filled an anonymous and voluntary survey in the last day of the course. 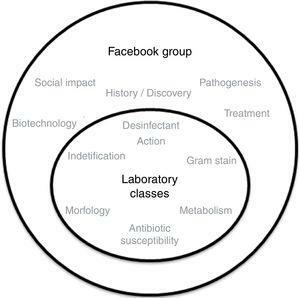 In this survey, students evaluated the “Adopt project” as an approach to teach microbiology, and the use of Facebook as a platform to develop the project. They also made a self-evaluation of their participation and reported to us if the project clarify microbiology contents. The form was filled by 65 students. “Adopt a Bacterium” impact on the students’ use of research source. (A) On the last class survey, students were asked whether they had used new research sources, and the majority of the answers were “yes”. (B) Additionally, we asked them “If you said YES, what were the new reference sources you used?”. To represent the answers, we built a cloud of words with Wordle®, a tool that shows which words appear more frequently. We noticed that students started to use scientific sources. The following questions were addressed: Question 01 – Evaluate the “Adopt Project” as an approach to Microbiology learning; Question 02 – How do you evaluate the use of Facebook® as a platform to develop this project; Question 03 – How do you evaluate your participation in the project; Question 04 – Does this project facilitates your understanding of the content proposed by the discipline; Question 05 – During the project, did you use any new reference sources that you had never used before? For the third survey, six months after the end of Bacteriology course, we invited students to answer the following question, “What do you remember about the adopted genus?” This was done in order to evaluate the retention of information by the students who had participated in the project. To assess question 05, and the question from the third survey, we generated a cloud of words with Wordle®, a layout algorithm for positioning words without overlap. The surveys were developed based on guidelines obtained in Gil,10 where authors suggested that a pre-test with some people can be considered as validation. We did pre-tests with some undergraduate students. We considered Facebook posts a formative assessment (When teacher evaluate student during the learning period, giving a quick feedback, and not necessarily giving numeral marks to evaluation) because of the quick feedback and the richness of the discussions obtained during the posting period. For summative assessment (When teacher evaluate students, given numeral marks for activities) we considered the seminars presentations and the oral questions answered after that. These two assessments compounded the students’ grade. For data collection we applied three anonymous and voluntary surveys to students that were part of the project. Although all students joined the activities, the questionnaires for the project feedback were voluntary. The first survey was filled by 61 students, the second was filled by 68 students, and the last one, applied six months after the end of the project, was filled by 41 students (Figs. 3–5). 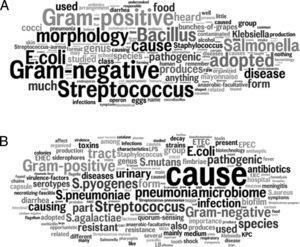 To analyze the first and third surveys we generated a cloud of words with Wordle® to compare the answers concerning the number and accuracy of microbiological concepts. For the second survey we counted answers and represented them in graphics for better visualization. “Adopt project” impact on students’ knowledge. (A) After the students chose their adopted bacterium, they were invited to answer the question “What do you know about the bacterium that you adopted?”. (B) Six months after the end of project, students were invited to fill another anonymous and voluntary form survey, where they were asked “What do you remember about the bacterium you had adopted in the course?”. The word cloud was built by Wordle®. We observed that the cloud B presents much more bacteriology concepts than cloud A. Therefore, even six months after the end of course, students still presented good retention of bacteriology concepts. The ethics committee for human experimentation of Biomedical Sciences Institute in University of São Paulo exempted this project of writing personal authorizations. Students were invited to fill an anonymous and voluntarily survey to provide quantitative and qualitative data for the evaluation of different aspects of the “Adopted project”. We explain the project to all students and that surveys would be used in a research. The main goal of this study was to develop a new approach for the teaching of Microbiology, named Adopt a Bacterium, striving to offer students an active role in the teaching–learning experience, which would hopefully make Microbiology learning more meaningful to them. To evaluate the efficacy of this new methodology, we applied surveys and presented the results in two ways: evaluation of students’ participation and acceptance of the procedures, and the impact of this approach on the specific field of learning performance. The pedagogical strategy to accomplish the proposed goals was to foster discussion groups with the students. The procedure is based on the work of several student groups, who post specific information about their adopted bacterium in the social media platform, promoting an active and collaborative learning environment based on shared and supervised discussions. In order to verify what previous knowledge students had of their adopted bacteria, we asked, “What do you know about your adopted bacterium?”. The answers were short and did not exceed a four-line description. For example, about Salmonella spp., a common answer was: “Salmonella is associated with food poisoning caused by eggs and mayonnaise”. In some cases, the answers and concepts presented were just plain wrong, such as the answer to a question about Streptococcus spp. Some students wrote that “The bacterium “Streptococcus aureus” is a gram-positive species, an antibiotic producer, and an opportunistic skin pathogen”. Based on basic information, we identified complete or partial misconceptions on the subject. It is important to note that these students had never attended microbiology classes prior to starting the course at the university, and the answers were all based on personal experiences and whatever microbial knowledge they had acquired at school. After the posting period on Facebook, we observed that a large number of students demonstrated growing interest in the subject, and became deeply involved with the teaching method. We credit this to the dynamics of the process and to the continuous interactions among students, mediators and professors. Interestingly, discussions on each post were rich in details, covering aspects such as quorum sensing, biotechnology and bacterial genomes. In general, most students enjoyed the experience and showed a very active and mature behaviour. To evaluate the “Adopt a Bacterium” project, we applied a questionnaire carefully designed to evaluate some important aspects of the learning process. In this survey, students were free to criticize and make suggestions. Overall, the evaluation was positive, with some degree of criticism and valuable suggestions. The questions and answers were as follows: (i) “Evaluate the “Adopt Project” as a learning approach for the study of Microbiology”, and the answers were 2% regular (01), 66% great (45), 32% good (22); (ii) “How do you evaluate the use of Facebook as a platform to develop this project?”, and the answers were 49% Great (33), 35% Good (24), 12% Regular (08) and 4% Bad (03); (iii) “How do you evaluate your participation in the project?”, and the answers were: 41% Great (28), 50% Good (34), 7% Regular (05) and 2% Bad (01); (iv) “Did this project facilitate your understanding of the content proposed by the course?, and 99% (67) students answered “YES”. This positive feedback from students showed that the “Adopt a Bacterium” project has the potential to be applied continuously in the Bacteriology discipline (Fig. 3). The present available information sources for students are diverse. Our experience shows that; students often search for information in textbooks or unchecked sources in the Internet. One of the “Adopt a Bacterium” project goals was to establish a critical perspective, in which students learn how to look for information from reliable sources, particularly regarding issues with a scientific basis. In this context, during the posts on Facebook, the role of mediators was essential to guide the students’ activities. One of the established guidelines was to post information that had a clear reference source. Consequently, this procedure helped us identify the commitment of the students, since we could trace the original source and check if the student had actually read the information before posting or if they were just copying and pasting. 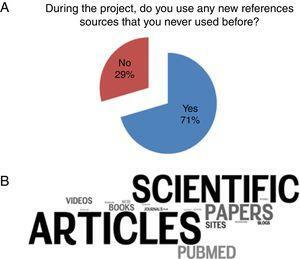 At the end of the posting period, using a voluntary survey, students were asked the following: “During the project, did you use any new reference sources that you had never used before?” and 71% (48) of the students answered “YES”. Additionally, we asked them “If you said YES, what were the new reference sources you used?” (Fig. 4). The words “scientific”, “articles”, “papers” and “PubMed” appeared more frequently, showing a significant change in the behaviour of the students towards the search of reliable information with a solid scientific basis. In this scenario, the information that was read, interpreted and posted was often based on solid scientific data, which goes beyond the information given in traditional classes by the professor. These results showed that thanks to the “Adopt a Bacterium” project, it was possible to achieve a better way of learning with undergraduate students, and most important, that they developed the critical skills necessary for any scientific research. Six months after the end of project, students were invited to fill another anonymous and voluntary survey, where they were asked, “What do you remember about the bacterium you adopted in the course?” Forty-one students filled out the form, and we built a cloud of words with the answers, to compare with the first survey (Fig. 5). We also ranked the answers according to microbiological general concepts. Gram stain was cited by 80.49% (33) students, morphology by 58.54% (24), pathogenesis by 73.17% (30), metabolism by 60.98% (25), antibiotics by 56.1% (23) and bacterial genome by 14.63% (06). We also asked them to evaluate the impact of the project in their current and future academic life. For their present academic life 53.66% (22) of the students evaluated the impact of the project as great, and 46.34% (19) as medium; for their future academic life 39.02% (16) of the students evaluated the project as great, 56.1% (23) as medium and 4.88% (02) as none. The students had a good overall evaluation of the “Adopt a Bacterium” project, and according to the survey answers, indicated that the project improved their learning ability, helping them to learn; what, according to Kinchin,11 allows a significant empowerment of students at the end of the project. At the end of the posting period students were invited to prepare and present a seminar about the adopted bacterial groups. We can consider the seminar presentation as a qualitative evaluation of the knowledge acquired by the students, together with some degree of creativity. For example, one of the groups working with Escherichia presented a debate about the different E. coli serogroups, and each student presented one specific serogroup associated with some specific type of pathogenesis. The group dealing with Salmonella spp. resorted to animation, in order to explain the invasion of intestinal cells, pathogenesis and other bacterial characteristics. Another group, dealing with Streptococcus spp., presented scenes inspired in the “Dr. House” TV show, where a patient described symptoms of different infections associated with different Streptococcus species. In general, all groups presented creative seminars, with solid scientific concepts, and they did so in a playful and enjoyable way. In conclusion, the results suggest that the “Adopt a Bacterium” project provided a number of valuable approaches to enhance the undergraduate learning process. The present report is based on the description and evaluation of an educational project, entitled “Adopt a Bacterium”, that was initially designed to foster an active and collaborative learning environment among undergraduate students of the Biomedical Sciences course at the University of São Paulo.12 The project is based on a widely used social media tool (Facebook platform), in addition to other class activities, that enabled students to retain concepts and inspired them to seek new information sources. The main pedagogical reference supporting design of “Adopt a Bacterium” was Joseph Novak's theory, that lies between cognitivism and humanism, in which students are learning with feelings, thinking with actions, and that goes beyond the intellect. It also considers that, for the learning process, cognitive and psychomotor activities are also important.13 The active interactions among professors, mediators and students were relevant concerns in the design of the project. The professors followed the posts and advised the mediators. The mediators were entrusted with the role of advising students, posing questions about the adopted genus and alerting them about conceptual errors. Students, who are the most important component of the learning process, were supposed to be active in the posting activity and bring research material about their adopted bacterial species or groups. We hypothesized that the active and collaborative construction of knowledge fostered by students’ active research and discussion on Facebook® would help them achieve higher cognitive skills. The searching for and exploring new sources of reliable scientific information led them to dive deep into the “learn how to learn” process, a skill that can and should be applied to other aspects in their academic life. The proposed teaching strategy developed in this project can be applied to other disciplines, with adaptations to specific fields (scientific or technical), making it possible to share information and results. The teaching approach based on a social media platform may be considered as an innovative method by both professors and institutions and may be easily incorporated into current learning processes. Developing science-based knowledge habits and encouraging self-learning abilities may inspire students to spot and value Science in their ordinary lives. Thus, the “Adopt a Bacterium” project enables both professors and students to change the learning process and shape it into a more active and dynamic practice, with the use of modern communication platforms and the understanding that when it comes to science, being able to learn by themselves, in a collaborative environment, is essential to any educational process. This research did not receive any specific grants from funding agencies, either in the public, commercial, or non-profit sectors. To students of biomedical and health sciences (2014/2015), that participated in the research. To teachers, postdoc fellows and graduate students who collaborated with this project. To Dr. Marina Martinez, for reviewing the manuscript.